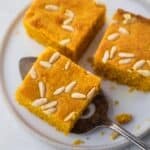 Sfouf is a Middle Eastern semolina turmeric cake, made with simple ingredients, no eggs and no butter. It's vegan-friendly, light and simply delightful! Sfouf is an arabic word that means lines and it’s used here to describe the way this cake is cut into lines. 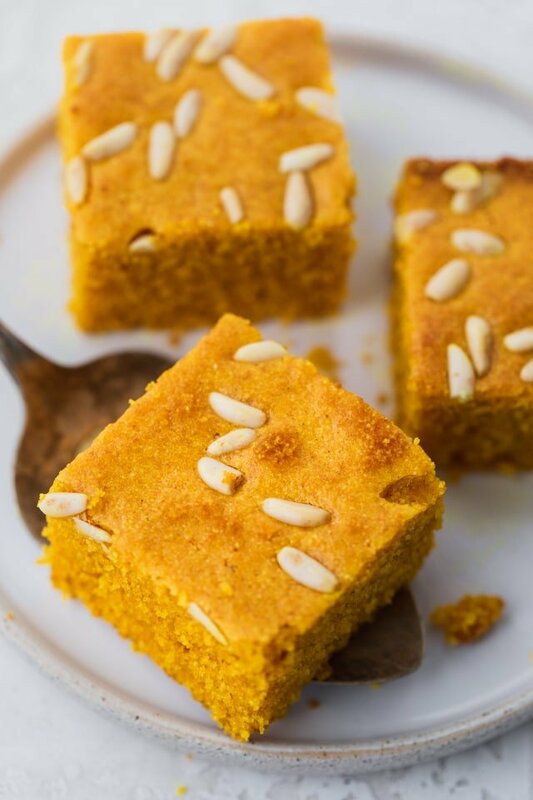 The cake itself is a semolina-turmeric oil-based yellow cake. It’s a simple plain cake with mild flavors and not at all sweet – the perfect light dessert or snack to go with your cup of coffee! What do you need to make sfouf? I learned this sfouf recipe from my mom and my mother-in-law. Both essentially make it the same way, but my mom likes to add rose water to the wet ingredients to give it a fresh aromatic flavor. You only need a few ingredients to make sfouf. The best part is that it’s egg-free and butter-free. And it’s almost vegan, except for the use of 1 cup of milk. 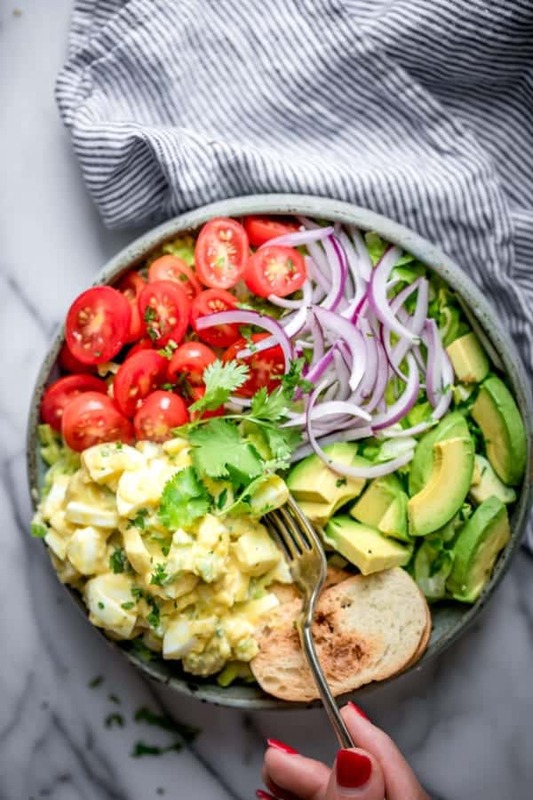 You can easily substitute that milk with plant-based milk or water to make this recipe fully vegan. Turmeric: The turmeric essentially gives the cake a rich yellow color, a sweet and distinct taste, and the added antioxidant benefits. 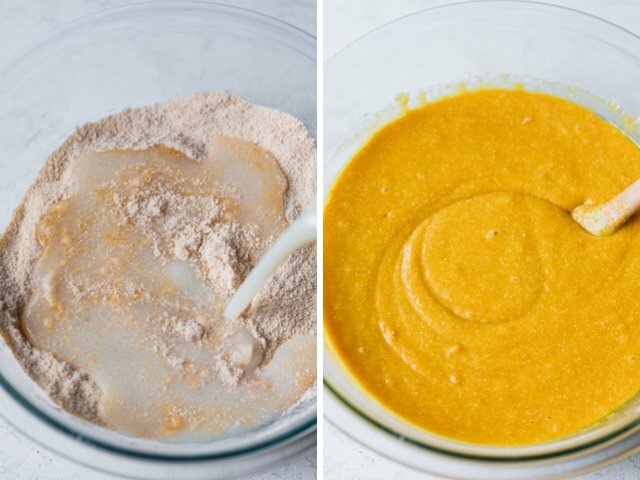 Just one tablespoon of turmeric mixed with the dry ingredients goes a long way. Semolina: This is a coarse purified wheat that’s usually used to make pasta. 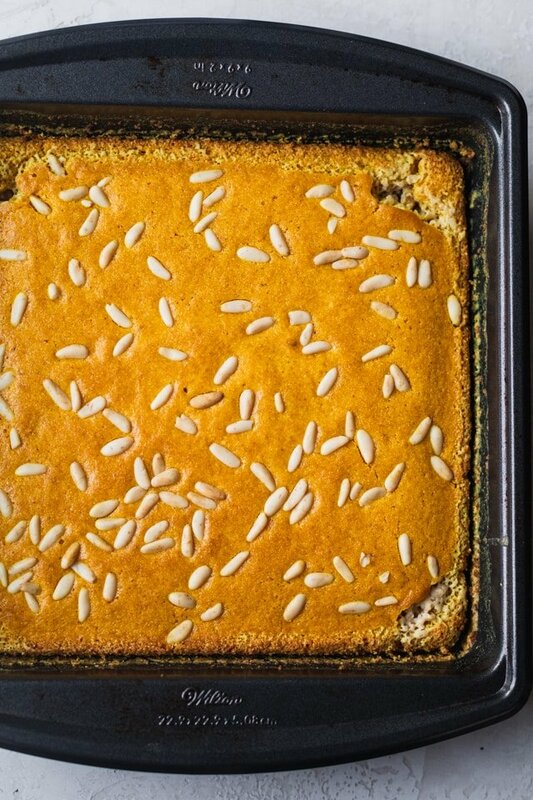 You’ll use the semolina in this cake along with flour to add a nutty texture, compared to just using flour alone. 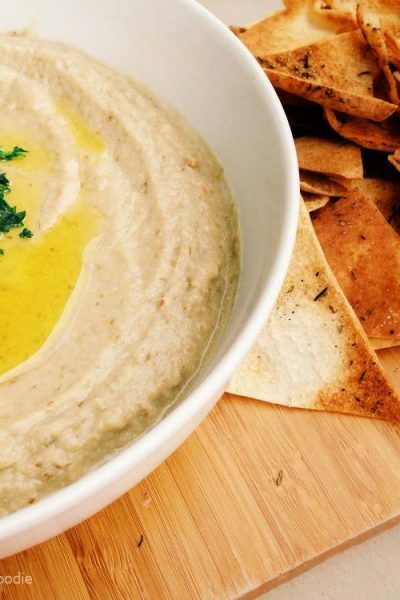 Tahini: This is a paste made from sesame seeds. I use it in this sfouf recipe to coat the pan, instead of oil or butter. It’s so widely available in all stores these days. But if you can’t find it, you can coat the oil with oil or butter instead. It just adds to the richness of the recipe. 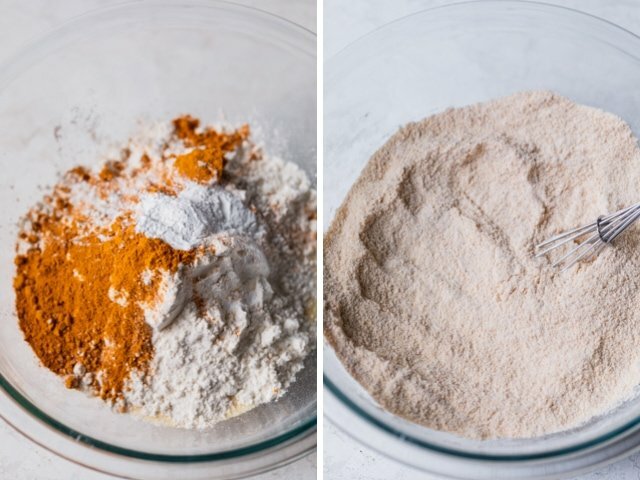 To start, you’ll want to mix together the dry ingredients: This includes the turmeric and you can see here the color is fairly light before cooking. Then comes the wet ingredients. Mix until the sugar dissolves, then combine the wet and dry ingredients together and the batter is ready to go. A unique step about this recipe is how we coat the pan. 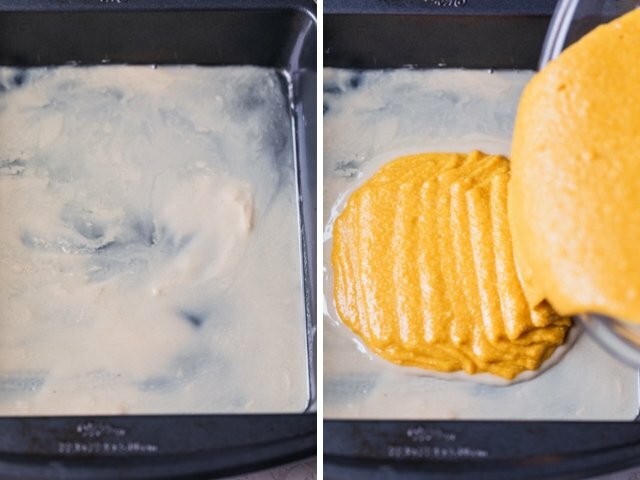 Instead of just using cooking spray, we use tahini to coat the pan. This serves two purposes: first it coats the pan with something oily so the batter doesn’t stick to the pan. And second, it gives the cake a nutty flavor that is pretty iconic of the cake. So after spreading the tahini on the baking pan, you can pour the batter over. It’s traditional to sprinkle the top of the batter with with raw pine nuts. You can also use almonds, or leave it out completely. Then you’ll bake the sfouf in the oven for about 30 minutes. Use the pine nuts as a clue to its readiness. You want them golden, but not brown. Grab that cup of coffee folks, because it’s sfouf time! You can cut them into squares, rectangles or diamonds – 9 or 12 pieces. 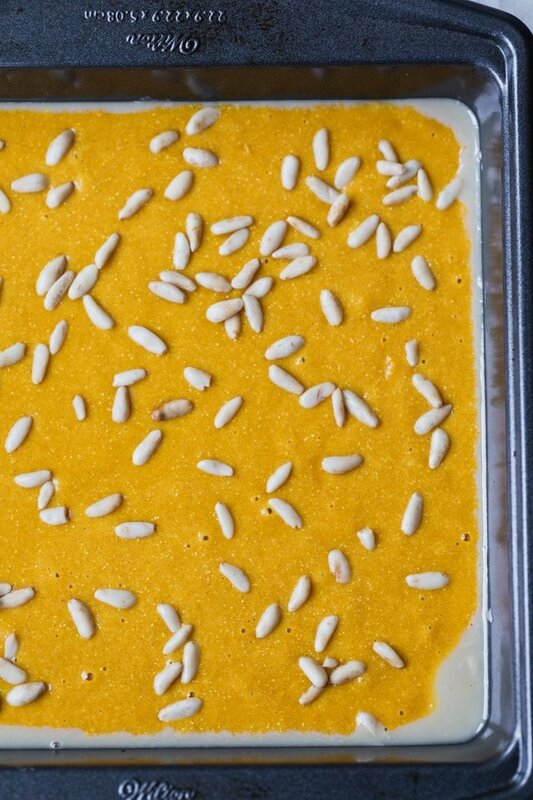 The end result is a beautifully colored simple turmeric cake that I grew up eating. 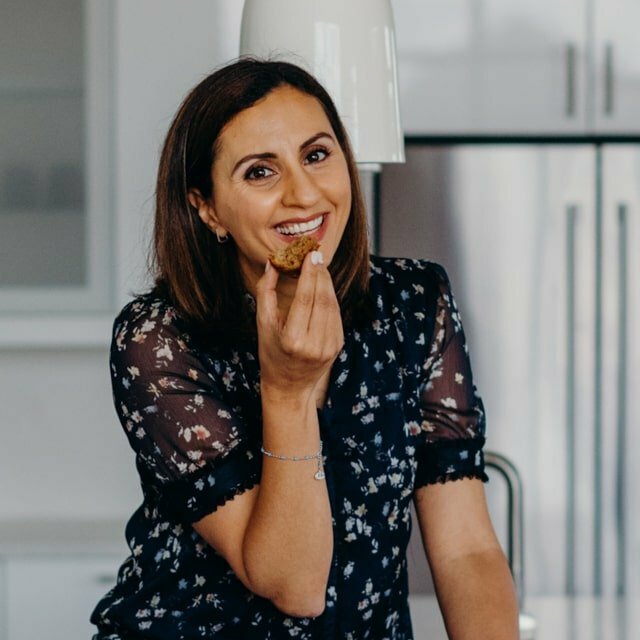 It’s one of the most popular Lebanese cakes, and I love how simple it is to make! Notice how the turmeric color became more enhanced after baking? 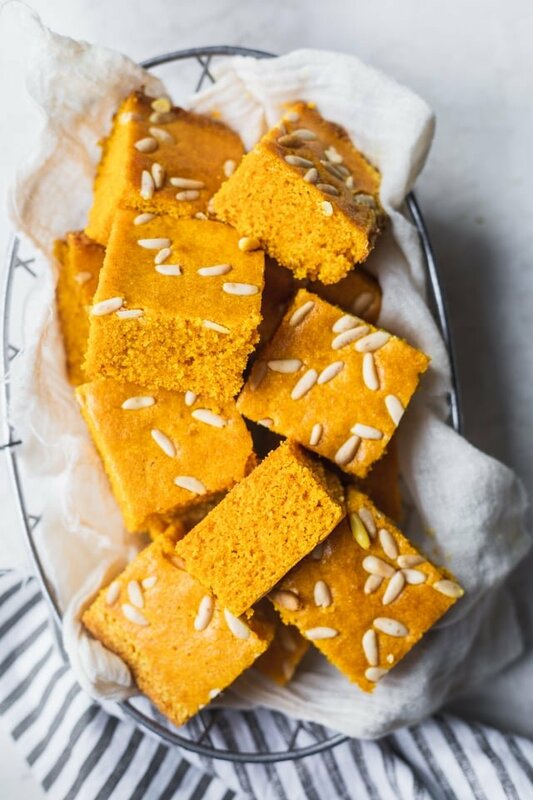 It’s pretty much turmeric cake, and it’s pretty much one of those iconic Lebanese/Middle Eastern desserts that we grew up having. If you’re obsessed with anything turmeric like I am, try my golden milk latte – it’s basically liquid gold in a cup. 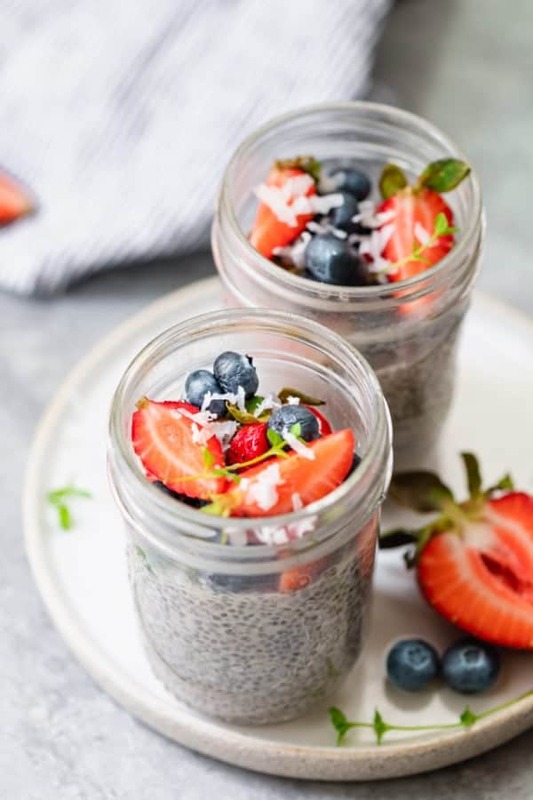 If you’ve tried this healthy-ish feel good Sfouf recipe or any other recipe on FeelGoodFoodie, then don’t forget to rate the recipe and leave me a comment below! I would love to hear about your experience making it. And if you snapped some shots of it, share it with me on Instagram so I can repost on my stories! Preheat the oven to 375ºF and grease a 9" baking pan with the tahini sesame oil or other oil. Mix the dry ingredients (semolina, flour, turmeric and baking powder) together in a large bowl. Mix the wet ingredients (canola oil, milk and cane sugar) in another small bowl until the sugar is completely dissolved in the mixture. Combine the dry and wet ingredients until batter is smooth and bright yellow. Pour the batter into the prepared pan, and sprinkle the pine nuts all over. Bake in the preheated oven for 30-35 minutes until the pine nuts are golden. Cool on a wire rack and cut into 16 squares or diamond shapes. Storage: Store any leftovers in an airtight container. They will last about 7 days at room temperature or about 10 days in the fridge. For the pine nuts, you can use almonds. Silvered almonds work well and make sure they are raw since they will be getting roasted in the oven. 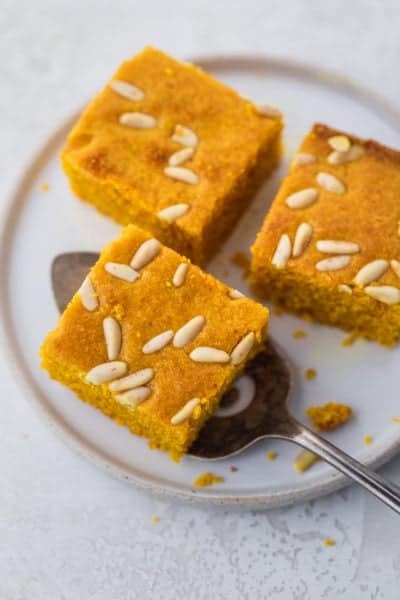 Sourcing: You can find some of the Middle-Eastern specific items like the semolina and tahini at Middle Eastern markets, natural-foods stores or even in large supermarkets, often located with other Middle Eastern ingredients. Nutrition: Please note that the nutrition label provided is an estimate only. It will vary based on the specific ingredients used. This recipe is estimated for 16 servings if you cut the sheet into 16 squares. My grand’ma used to boil a tablespoon of anis seeds with a cup and a half of water, add the cup of sugar to it to dissolve than add that to the dry ingredients of the Sfouf. She never added milk. The anis adds a very nice flavor to the Sfouf. I’ve made this recipe several times. Easy to follow and everyone loves it. Thank you! So happy to hear that you’ve made it so often and loved it!! Thank you for sharing! 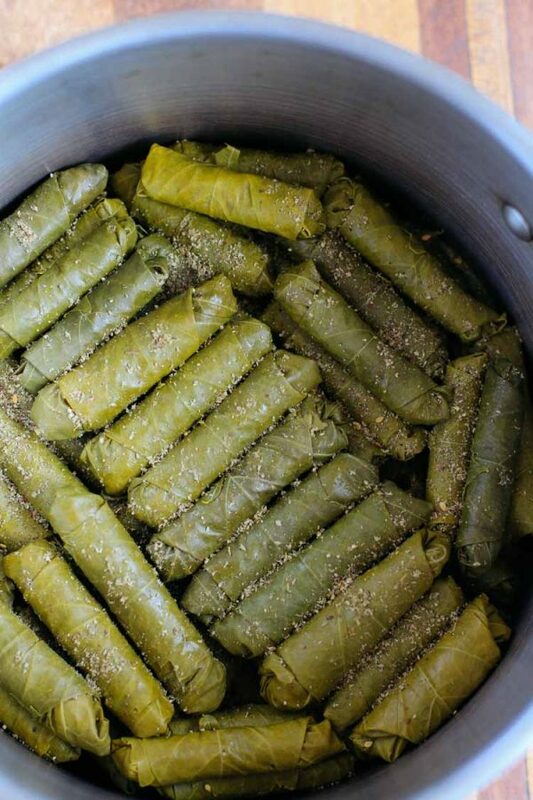 I’ve been looking for a perfect sfouf recipe to make for my Lebanese boyfriend and I think I found it! You mentioned that your mom adds rose water to the wet ingredients and I’d like to do that as well. One tablespoon would probably be enough, what do you think? I’m so glad to hear it and I hope you and your boyfriend love the recipe. Yes, I would do 1 tablespoon for the rosewater. Enjoy! This recipe sounds delicious! To make this fully vegan, do we substitute the 1 cup of milk with 1 cup of water? Would it also be okay to use almond milk instead of water? Thanks in advance! Yes, you can any kind of milk or just water! Hope you like it! 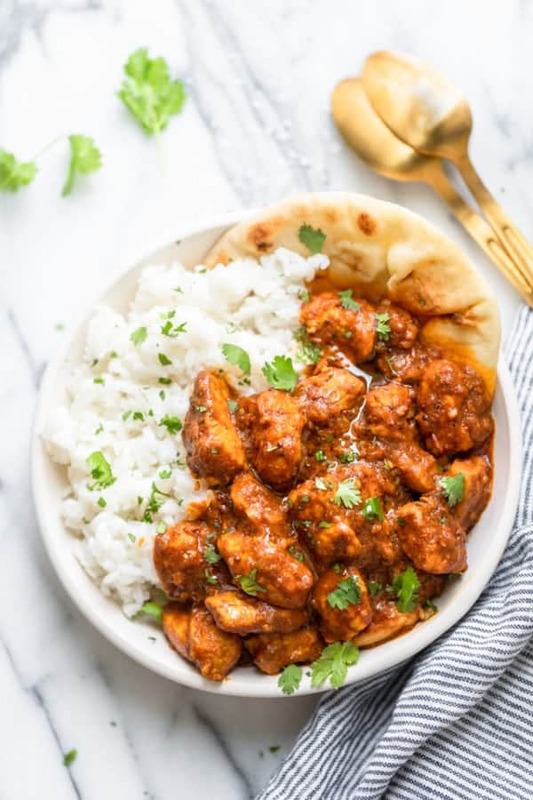 This looks great, and I plan to try it as soon as I can get out to the store to buy semolina flour. I think there is an error in your nutritional values: you show that each slice contains 1.5 gm of sugar. However: the recipe calls for 1 cup of sugar, which is the equivalent of 16 tbsp; which means that each serving would include 1 Tbsp. And, 1 tbsp of sugar is about 15 gm, not 1.5 gm. Perhaps a decimal point slipped in during the recording of the info? Hi there, you’re so right…the sugar was actually left off the nutrition information by accident! Thank so much for pointing it out and I just updated it so it’s now correct. Unfortunately semolina is not gluten-free and it’s an important part of the recipe. However, I would love to see you try it with a gluten free flour and let me know how it works! !